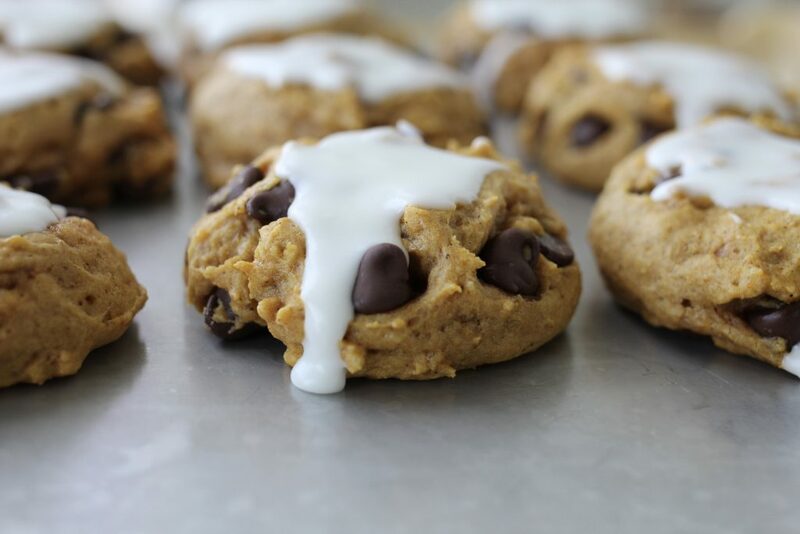 Pumpkin chocolate chip cookies are my favorite! I love the combination of soft pumpkin cookies topped with a tangy not too heavy lemon icing. October, month of pumpkin desserts. Blogs, websites and magazines are filled with cookies, pies, breads and cakes made with pumpkin. I like, but don’t love pumpkin. And I have a hub who really doesn’t care for pumpkin at all . When I made these and handed one to Grant, I asked – what do you think?? He took a huge Grant bite (this consists of eating a three bite cookie in one bite) looked up at me and said in a very matter-of-fact way “I don’t like it.” My boys burst out laughing. This prompted a discussion (led by ME) on gratitude and being too honest. 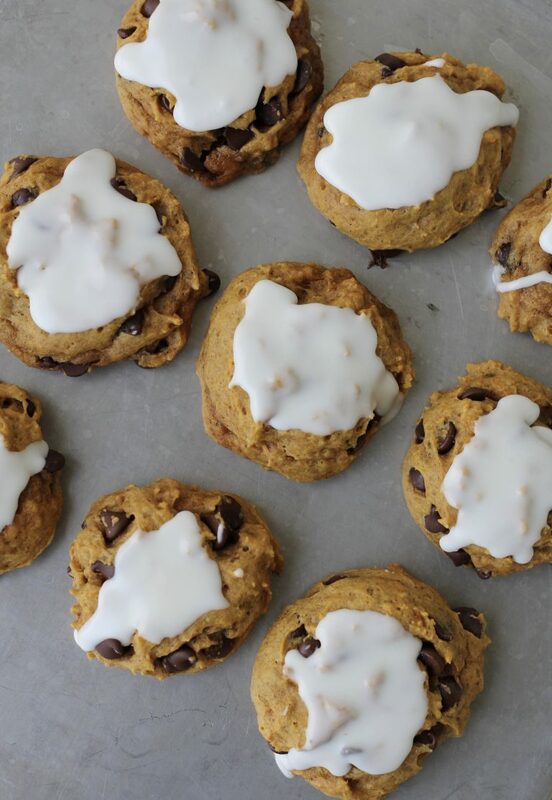 I love the addition of a little lemon icing to the humble pumpkin chocolate chip cookie. The kids weren’t crazy about the icing, but I love it. The boys loved the cookies plain and un-iced. I think the icing gives the cookie a great added flavor and a nice little contrast in color. Pumpkin cookies are so orange, I like the white contrast! The ingredients in this classic cookie are almost identical to my favorite pumpkin bread recipe. I am loyal to Libby’s brand pumpkin which is sold in a few different size cans. Make sure to buy pure pumpkin, not pumpkin pie filling. The pumpkin keeps the cookies moist for days and are best when sealed, in a single layer, in a container that is covered with plastic wrap or a lid. Kids and adults (well, most adults) love this recipe and I know you will too! Inspiration for this recipe from Joy the Baker. Positions rack in middle of oven. Preheat to 325 degrees. Mix all dry ingredients together in bowl, set aside. In another large bowl, beat eggs and sugar until smooth about 1 minute. On low speed, mix in rest of wet ingredients. Scrape down sides of bowl. Add the dry ingredients and the chocolate chips all at once. Mixing just until wet and dry ingredients are incorporated. Don’t over mix. Spoon the batter out onto a parchment lined or lightly greased cookie sheet by tablespoons. About 12 cookies per sheet. Bake until the tops feel firm about 10-12 minutes. Cool completely. Frost if desired. Cookies are best when eaten within 2 days. Mix all ingredients together in small mixing bowl, whisk or beat with blender until smooth. Frost or drizzle the cookies with icing. -I found a recipe for pumpkin cookies that suggested adding butterscotch chips. I love butterscotch, so I added a cup. The chocolate chips were soft and perfect in the cookies ( I added another cup to equal two cups total to the original recipe), but the butterscotch chips hardened up and didn’t have that melt in your mouth quality, unless eaten while still warm. 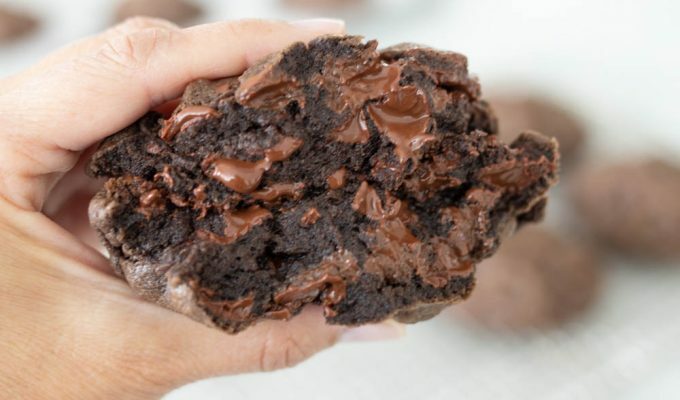 My recommendation, go with all dark (semi sweet) chocolate chips in this cookie. okay, these look great. i love the addition of icing! THESE ARE THE BEST PUMPKIN COOKIES EVER!!!!!!!!!!!!!!!!!!!!!!! These are fabulous, fortunately I love pumpkin! For a change try orange zest and burnt butter frosting. You have an amazing blog. Thank you! Thank you Carol! I will give it a try next time!